How Do Carpenter Ants Get in the Home? 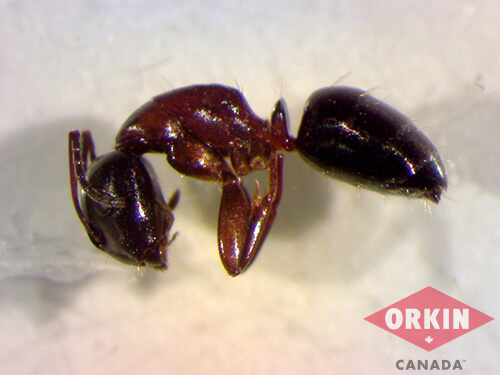 Black carpenter ants are common structure infesting ants found throughout Canada. The tiny insect primarily lives outdoors but gains access to homes when looking for food sources and sites to establish satellite nests. Kitchens and other areas of the house where meals are held serve as common draws to the ant. Carpenter ants enter homes in bathrooms, roofs or basements where leaky pipes and general moisture soften baseboards and other access points so that ants can dig or excavate to invade. They also crawl along and through utility lines, via shrubs or tree branches touching houses. Once indoors, carpenter ants can establish nests in wall voids, attics, insulation, crawlspaces etc. The ants are capable of burrowing through sound wood but prefer softer, water and heat-compromised woods, in both homes and outdoors, to build into or travel through. The damage caused by carpenter ants usually manifests in the declined structural integrity of joists, trusses, support beams, and the overall foundation of a home. Carpenter ants dig elaborate systems of tunnels into woods within homes and outdoors, which are recognizable by piles of removed saw-dust like debris at tunnel entrances and exits. Homeowners will generally see the large worker ants of carpenter ant colonies first. The large, wingless ants act as scavengers and often report back to their respective colonies about food sources. As such, worker ants seen in the home may not necessarily signal an infestation but rather the possibility of one as sightings clearly indicate viable access points for the species of ant. The most important key factors that attract carpenter ants in homes and yard are moisture and dead wood. In order to prevent a carpenter ant infestation in homes and on property, residents should inspect and repair water leaks from faulty pipes or roofs. Wood structures compromised with such leaks should be ventilated to dry. If possible eliminate or reduce dead/decaying wood, logs or trees stumps from yards. Trim back shrubs or tree branches that touch the house. In doors, homeowners can prevent the attraction of carpenter ants by cleaning up food spills and putting meals away as soon as possible. Removing excess moisture from the air by proper ventilation also helps detour carpenter ant infestations. Like all other insects, the carpenter ant is a cold-blooded animal whose body temperature fluctuates to match the changes in temperature of the surrounding environment. During the winter in Canada, where the season often produces bitterly cold weather, carpenter ants become incapable of maintaining a body temperature high enough to support physical activity. Consequently, the insects hibernate in the nest and remain inactive until the arrival of warmer weather in the spring. Regardless of the placement of the nest, most carpenter ant colonies become dormant in winter, especially when exposed to the outdoor elements. Indoor nesting sites, however, sometimes receive enough heat for carpenter ants to forage actively throughout the year. For indoor colonies to remain active during the winter, the nest must occupy a site within close proximity to a heat source. Wall voids directly in the path of sunlight or heated air from a furnace often provide the warmth needed to stimulate the activity of carpenter ants. When carpenter ants inhabit heated indoor areas during winter, the insects typically wait until the nighttime hours to come out and search for sources of moisture in places like bathtubs, dishwashers, sinks, and toilets. However, on particularly sunny days, carpenter ants may emerge from the nest and explore other parts of the home. During the winter months, the presence of carpenter ants actively moving around in the house is a clear indicator of an indoor infestation. To control an active infestation, contact a licensed pest control professionals, who will use most effective and appropriate treatment strategies to control the infestation. In cases of extreme infestations and structural damage, homeowners should consider replacing damaged baseboards, floorboards, struts, studs, and joists due to the compromised strength of the woods after carpenter ants have successfully been treated and controlled. Replacing affected wood may also limit access points for future infestations.